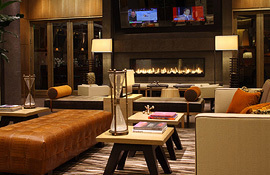 Opened in 2011 and designed to LEED Silver Certification standards, The Hotel at Arundel Preserve offers airy contemporary design, loads of seating in the stylish public spaces, two restaurants with relaxed vibes, and excellent mojitos. Ample use of natural light is part of the green design—and there are charging stations if you arrived in your electric car. The fitness room is spacious, and stocked with universal weights and cardio-equipment. The 150 guestrooms are designed with clean lines and neutral cream and chocolate colors. Some come with cozy seating nooks built into the walls; all come with an important feature for road warriors: window shades that really keep the room dark. Like your java? Wake up to a Keurig coffee-maker in your room. Grillfire's exposed brick and wood-beamed ceilings and long bar set a casual, friendly tone, but the food trends upscale. Try Steak & Cake to get the best of local flavor: crab cake plus filet mignon. Vivo Italian Kitchen and Wine Bar transports guests to a rustic Italian kitchen reminiscent of Tuscany. Everyone will find something to savor or sip on vino from a carefully crafted wine menu. There's more than 10,000 sq. ft. of meeting space, all with the same warm, modern design and airy feel that graces the rest of the hotel. Arundel Mills Mall and MarylandLive! Casino provide nearby entertainment. The Hotel at Arundel Preserve is in Hanover, MD, between Baltimore, Washington DC, and Annapolis. BWI Airport is 10 minutes away. Reservations must be cancelled 24 hours prior to date of arrival by 6pm EST. The Hotel at Arundel Preserve is the perfect Hanover, MD venue for your next event, meeting or function. The Hanover hotel is ideally located near Baltimore Washington Airport (BWI) and just 15-minutes from the government facilities at Fort Meade. The Hotel at Arundel Preserve provides 10,000 square feet of flexible indoor and outdoor meeting space that can accommodate meetings and conferences of all sizes. Whether you are hosting a board meeting, a full-scale banquet, or a gala, The Hotel at Arundel Preserve’s contemporary space will offer an experience that is a remarkable success.